For nine weeks, I had an on-site gig — meaning I went to an office for 8 hours a day. It was a nice change of pace. Getting to the downtown west side digs from my uptown far east side apartment wasn’t simple. My choices were either a bus and a train, or a train and walking cross town through a congested part of the city. The first few weeks I tried the latter option, then I tried the former. Both left me tired and stressed. By the time I got home, I was as angry as a bull. (My son’s assessment, not mine.) I was miserable. Then one day I took the train uptown and, instead of hoping on the bus, I decided to walk across Central Park. I instantly felt calmer. And the next morning, I decided to walk to same train stop on my way to my job. I felt calmer, happier. And on the days that I couldn’t leisurely get home, I was a stress ball. The secret: Getting into nature. Studies have linked nature to lower levels of the stress hormone cortisol. Better yet, just 5 minutes can make a difference, according to a 2010 study in the journal Environmental Science & Technology. Specifically, doing some form of light exercise, like walking, can deliver the boosts in mood and self-esteem. No wonder this small change made such a difference! 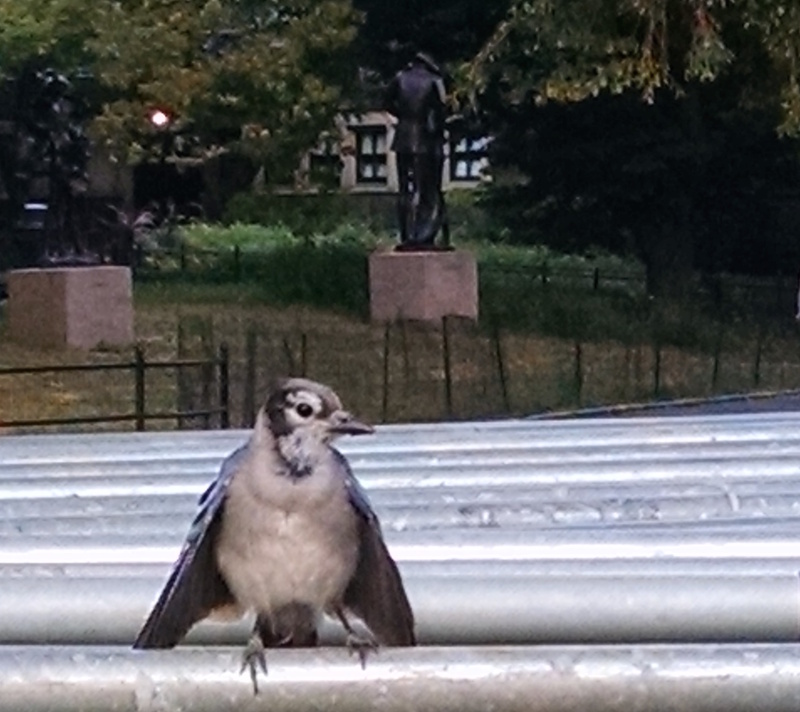 It didn’t hurt that it allowed me to get some exercise in daily — it was a 4-mile walk round trip — and meet characters like the blue jay pictured above.